Although Islamists were outnumbered by Liberals and Centrists in the GNC, in May 2013 they lobbied for a law "banning virtually everyone who had participated in Gaddafi's government from holding public office". While several Islamist political parties and independents supported the law, as they generally had no associations to the Qaddafi regime, the law enjoyed strong public support. Polls demonstrates that a large majority of the Libyan people supported the exclusion of high-ranking Qaddafi-regime officials. 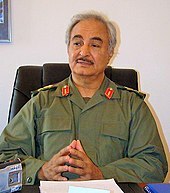 On 14 February 2014, General Khalifa Haftar ordered the GNC to dissolve and called for the formation of a caretaker government committee to oversee new elections. However, his actions had little effect on the GNC, which called his actions "an attempted coup" and called Haftar himself "ridiculous" and labelled him an aspiring dictator. The GNC continued to operate as before. No arrests were made. Haftar launched Operation Dignity two months later, on 16 May. ^ "Putin Promotes Libyan Strongman as New Ally After Syria Victory". Bloomberg. December 21, 2016. ^ "Khalifa Haftar says Egypt and Chad are his top supporters". Libyan Express. September 6, 2016. ^ "Human Rights Solidarity: About 4000 people were victims of armed fighting in Libya in 2018". Libya Observer. Retrieved February 12, 2019. "Libyan security forces pushing Islamic State back from vicinity of oil terminals". Reuters. 2016-05-31. Retrieved 2016-05-31. "Al-Bunyan Al-Marsoos captures Harawa district, says will free Sirte in two days". The Libya Observer. 2016-06-09. Retrieved 2016-12-07. ^ a b "Two lawmakers shot in Libya as protesters storm parliament". Deutsche Welle. 2014-03-03. Retrieved 2016-12-07. ^ "Libya Revolutionaries Joint Operations Room (LROR) | Terrorist Groups | TRAC". www.trackingterrorism.org. Retrieved 2016-12-07. ^ Kirkpatrick, David D.; Myers, Steven Lee (2012-09-12). "Libya Mission Attack Kills U.S. Ambassador". The New York Times. ISSN 0362-4331. Retrieved 2016-12-07. ^ "فضيلة الشيخ الصادق الغرياني : مفاهيم خاطئة .. الوقوف على مسافة واحدة". www.alwatan-libya.net. Retrieved 2016-12-07. ^ "Operation Dignity continues in Libya led by Haftar | The Libya Observer". www.libyaobserver.ly. Retrieved 2019-04-15. ^ "Tripoli-backed fighters sent to Sirte to confront ISIL". Al Jazeera. Feb 2015. ^ "Haftar's troops recapture key stronghold in Libya's Benghazi". Asharq al-Awsat. Feb 2015. ^ Jomana Karadsheh & Ben Brumfield (May 20, 2014). "Libya announces elections: Will it help calm the violence?". CNN. Archived from the original on 24 May 2014. Retrieved May 23, 2014. ^ Jomana Karadsheh & Ashley Fantz (May 19, 2014). "Turmoil in Libya: Fighting sweeps across Tripoli following violence in Benghazi". CNN. Archived from the original on 24 May 2014. Retrieved May 23, 2014. ^ Oakes, John (May 30, 2014). "Karama – Some Notes On Khalifa Hafter's Operation Dignity". Libya Stories. Retrieved May 31, 2014. ^ Mahmoud, Khalid (May 22, 2014). "Khalifa Haftar: My forces will reach Tripoli soon". Asharq Al-Awsat. Archived from the original on 12 July 2014. Retrieved May 31, 2014. ^ Exam Mohamed & Sarah El Deeb (May 18, 2014). "Libyan lawmakers run for lives as gunmen ransack legislature". Toronto Star. Associated Press. Archived from the original on 22 May 2014. Retrieved May 22, 2014. ^ Wehrey, Frederic (July 29, 2014). "What's behind Libya's spiraling violence?". The Washington Post. Retrieved August 7, 2014. ^ a b "Libya's Islamist militias claim control of capital". The Washington Post. Associated Press. 24 August 2014. Archived from the original on August 25, 2014. Retrieved 26 August 2014. ^ "Deadly clashes follow UN call for peace in Libya". France 24. October 12, 2014. Retrieved October 13, 2014. ^ "Who's Running This Joint, Anyway?". Foreign Policy. October 13, 2014. Archived from the original on October 14, 2014. Retrieved October 13, 2014. 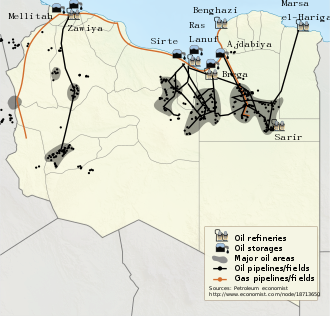 ^ "Islamic State's takeover of Nawfaliya highlights increasing risks to oil fields and personnel in Libya's Sirte Basin". janes.com. 9 February 2015. Archived from the original on February 13, 2015. Retrieved 13 February 2015. ^ Zaptia, Sami (1 January 2016). "Ageela Salah now supports UN-brokered Skhirat agreement: Kobler". Libya Herald. Archived from the original on 24 February 2016. (Subscription required (help)). ^ "IS, armed men clash near Libyan capital, four dead: local official". Yahoo News. 2016-02-23. Retrieved 2016-02-23. ^ "Sudden IS assault on Sabratha wreaks havoc". Libya Herald. 2016-02-23. Retrieved 2016-02-23. ^ "Libya conflict: Tunis-based unity government claims power". BBC News. 2016-03-12. Retrieved 2016-03-12. ^ "Libya's Presidential Council calls for transfer of power to unity government". Reuters. 2016-03-12. Retrieved 2016-03-12. ^ "Europe agrees sanctions on Libyan leaders blocking unity government". Yahoo! News. 2016-03-16. Retrieved 2016-03-17. ^ "Libya's U.N.-backed government to move to Tripoli within days: PM". Yahoo! News. 2016-03-17. Retrieved 2016-03-17. ^ "Libya's Tripoli Government Declares a State of Emergency". ABC News. 2016-03-24. Archived from the original on March 31, 2016. Retrieved 2016-03-24. ^ "Members of Libya's UN-backed Presidential Council arrive in Tripoli". Times of Malta. 2016-03-30. Retrieved 2016-03-30. ^ a b "Rebel Tripoli administration vanishes. Ghwell flees to Misrata". Libya Herald. 2016-03-31. Retrieved 2016-03-31. ^ "Backing for the Presidency Council continues to grow in west and south; uncertainty in east". Libya Herald. 2016-04-02. Retrieved 2016-04-02. ^ "Libyan oil firm NOC says it will work with new unity govt". Reuters. 2016-04-02. Retrieved 2016-04-05. ^ "Libya's Tripoli Government Says Will 'Cease Operations'". ABC News. 2016-04-05. Retrieved 2016-04-05. ^ "Tripoli authorities cede power to Libyan unity government: statement". Yahoo! New Zealand. 2016-04-05. Archived from the original on 2016-04-15. Retrieved 2016-04-05. ^ "GNC members announce its "dissolution" and creation of the State Council". Libya Herald. 2016-04-05. Retrieved 2016-04-05. ^ "Serraj: Preparations for Sirte liberation battle underway". Libyan Express. 2016-04-29. Retrieved 2016-04-29. ^ "Nation-wide Libyan force, under unified command, without foreign interference to liberate Sirte from IS: Serraj". Libya Herald. 2016-04-29. Retrieved 2016-04-29. ^ "Misratans say they have taken Sirte power station". Libya Herald. 2016-05-29. Retrieved 2016-05-31. ^ "Misurata forces advance to southern Sirte". Libya Herald. 2016-05-31. Retrieved 2016-05-31. ^ "Libya's UN-backed government gets 'no confidence' vote". Al Jazeera. Al Jazeera Media Network. August 22, 2016. Retrieved August 23, 2016. Qyman al-Warfalli (August 22, 2016). "Libya's eastern parliament votes against U.N.-backed government in Tripoli". Reuters. Retrieved August 23, 2016. "House of Representatives rejects GNA's cabinet". Libyan Express. August 22, 2016. Retrieved August 23, 2016. ^ Qyman al-Warfalli (August 22, 2016). "Libya's eastern parliament votes against U.N.-backed government in Tripoli". Reuters. Retrieved August 23, 2016. ^ "House of Representatives rejects GNA's cabinet". Libyan Express. August 22, 2016. Retrieved August 23, 2016. ^ "Haftar's forces attack a town near Libya's Misrata | The Libya Observer". www.libyaobserver.ly. Retrieved 2019-01-16. ^ Reuters (2019-01-16). "East Libya forces to secure oil sites". defenceWeb. Retrieved 2019-01-20. ^ "Malta willing to have resident ambassador in Libya again". The Malta Independent. 2017-11-15. Retrieved 2018-04-23. ^ "France says three soldiers died in accident on Libya intelligence..." Reuters. 2016-07-20. Retrieved 2018-02-24. ^ "France confirms three soldiers killed in Libya". Al Jazeera. 2016-07-20. Retrieved 2018-02-24. ^ Balmer, Crispian (2016-03-04). "Two Italian hostages freed in Libya after companions die". Reuters. Retrieved 2018-02-24. ^ "U.S. Navy SEALs take over oil tanker for return to Libya". Washington Post. 2014-03-17. Retrieved 2018-02-24. ^ Starr, Barbara; Sterling, Joe; Ansari, Azadeh (2014-07-26). "U.S. Embassy in Libya evacuates personnel". CNN. Retrieved 2018-02-24. ^ Pengelly, Martin; Stephen, Chris (2015-11-14). "Islamic State leader in Libya 'killed in US airstrike'". the Guardian. Retrieved 2018-02-24. ^ Starr, Barbara (2017-01-19). "First on CNN: US bombs ISIS camps in Libya, dozens killed". CNN. Retrieved 2018-02-24. ^ Browne, Ryan (2017-09-24). "US strikes Libya for first time under Trump". CNN. Retrieved 2018-02-24.